If you add kale to buttery mashed potatoes, that makes it healthy, right? Ha! 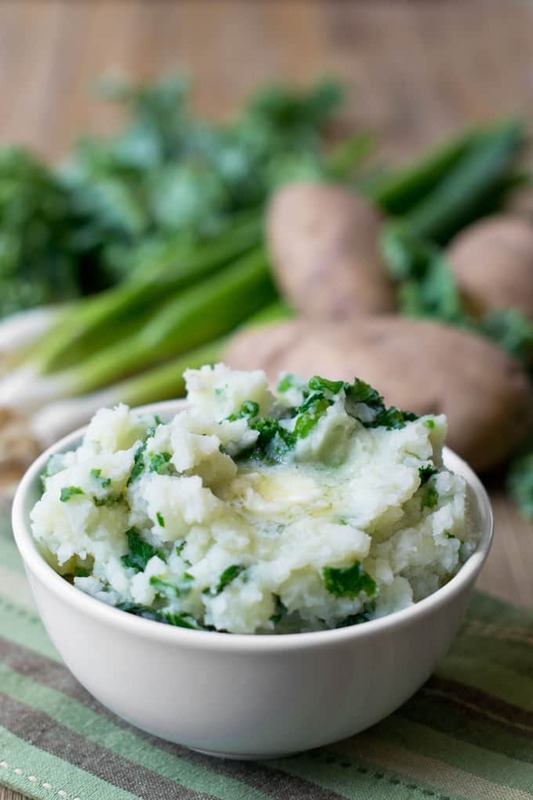 You’ve gotta try this Irish classic called Colcannon. 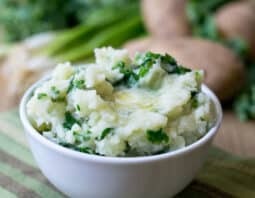 A couple of years ago I was looking for some Irish recipes to make for St. Patrick’s Day when I stumbled on Colcannon. It sounded ok. Mashed potatoes mixed with cabbage or kale and green onions. I could go for that, a bit of green in my spuds. I read through some recipes and found something in a few of them (like this one) that made me excited. It’s the way the recipes said to serve it. You scoop the mashed potatoes into serving bowls. Then you put an indentation into each mound of potatoes. Then…then…then…you add a slice of cold butter to that indentation. By the time the bowls of potatoes make it to the table, the butter has melted into a little yellow puddle. As you dip your fork into the mash each time, it will go through that puddle each time. Oh my god, right? I just had to try it and I’m so glad that I did. Delicious! You are so going to love this one! Peel the potatoes an cut them into 2-inch chunks. Put them in a large pot with 2 teaspoons of salt and enough cold water to cover them. Partially cover the pot and bring it to a boil over high heat. Remove cover and reduce heat to a simmer. Cook until potatoes are fork tender. Drain and leave them in the colander. Add butter to the pot and put it over medium heat until it melts. Add the kale and 1/2 teaspooon of salt. Use tongs to stir it until it is well-wilted, 3-4 minutes. Add the green onions and cook for 30 seconds more. This recipe originally appeared on my sister site COOKtheSTORY.